I'll be buying this comic just for the cover. 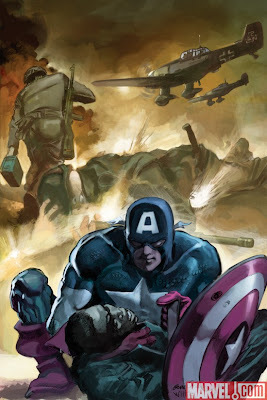 I'm not sure there's anyone around who draws Captain America quite like the master himself, Gene Colan. You can find some more scans over at Tom Brevoort's blog. On August 15, 2009, the off-Broadway science-fiction comedy StarStruck by Elaine Lee, Susan Norfleet Lee, and Dale Place, basis for the 1980’s comic book series by Elaine Lee and Michael Wm. Kaluta (who provided set and costume designs for the original production), will be presented for the first time in 25 years as an audio theatre-style live reading at the famed Henry Miller Library in Big Sur, CA. Proceeds will help pay the medical bills of comics legend Gene Colan, the bills stemming from his bout with liver failure in 2007 and 2008. Colan is best known for his distinctive artwork on such titles as Iron Man, Daredevil, Batman, and Tomb of Dracula (from which the character Blade was introduced).